A hierarchical micro flower structure NiCo2O4/GN/Fe3O4 composite was prepared with a two-step method. Then Fe3O4 nanoparticles were dressed up on petals of NiCo2O4/GN/Fe3O4 composite. It was successfully detected by instruments to analysis crystal texture, surface elements, micro morphology, magnetic properties and weight loss. Results showed that good synergistic effect of dielectric loss and magnetic loss of NiCo2O4/GN and Fe3O4 led to superior EM wave absorption. The minimum RL was − 38.18 dB at 10.6 GHz and effective absorption bandwidth < − 10 dB was reached 2.7 GHz (8.5–11.2 GHz) with the thickness 2.5 mm. 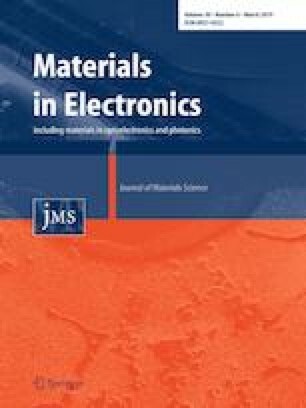 The enhancement of EM wave absorption was attributed to the dielectric loss, magnetic loss, interfacial polarization, effective impedance matching and multiple scattering. Thus, the NiCo2O4/GN/Fe3O4 composite was a promising and developable material in EM wave absorption fields.